For A Few Dollars More provides demarcation in style and composition for Controlled Dissonance. A departure release created to explore different compositional techniques that produced a series of pieces stylistically unlike its predecessors. 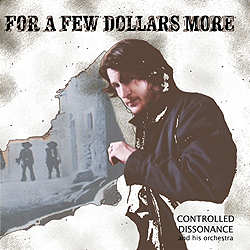 Ranging from the harshly abstract to the suspiciously consonant, For A Few Dollars More reflects a changing depth for the Controlled Dissonance project, while still maintaining that trademark refined palate and penchant for exquisite detail for which the project is renown.